You've already seen the trailer for Splinter Cell Conviction's co-op mode, but now you can witness the co-op campaign in action. 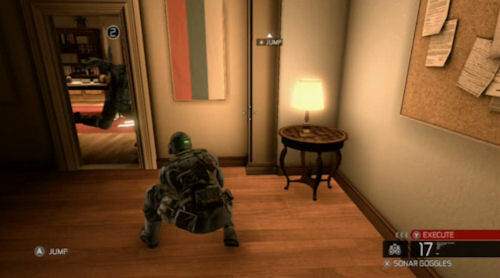 The footage is narrated by Patrick Redding, game director for Splinter's Cell multiplayer. In it we see some of the unique co-op only moves players can combine to do, and situations that are advantageous to having a second set of eyes. Little touches like being able to tag an enemy so your partner can see them really make this stealth action game one to watch early next year. If the impressions posted around the web are any indication, this could be a very finely tuned co-op experience. Once we'd stormed our target's office, it was time to interrogate him. I ran his face in a paper shredder and dented in a safe door with his head before he agreed to open a biometric-secured door for us. Multiplayer director Patrick Redding, who was standing by during the demo, was quick to say, "No," when asked if it was possible to accidentally kill an enemy during interrogation sequences. To find out what happens next, I recommend watching the trailer. Remember, this story based mode is only one half of the co-op experience in Splinter Cell Conviction. There's an entire survival and challenge mode for up to four players as well. Here was Joystiq's final say on it. As you can tell, the demo wasn't very long. But it was very, very solid -- and quite fun. That Splinter Cell: Conviction will include a substantial co-op campaign that plays this well, in addition to Sam Fisher's story of revenge, is incredibly exciting; we just hope the situations and objectives will continue to be engaging enough to keep us on our toes and still uttering "wows" until the credits roll. All of this is excellent news as all these co-op modes are playable in either split screen (360 Only) or online. Now turn off the light, fire up your night vision goggles, and enjoy the walk through. Page created in 0.3349 seconds.